Greetings from Kampala! I’ve only been here a week, but it’s starting to feel like home in a lot of ways. Yes, I am in Uganda, and yes I am on an adventure, but this summer already feels quite different because I am living and working in one place instead of moving around constantly like a nomad with ADHD. Don’t get me wrong—I am definitely going on some weekend excursions (stay tuned!) but I am actually enjoying the feeling of settling in halfway across the world. 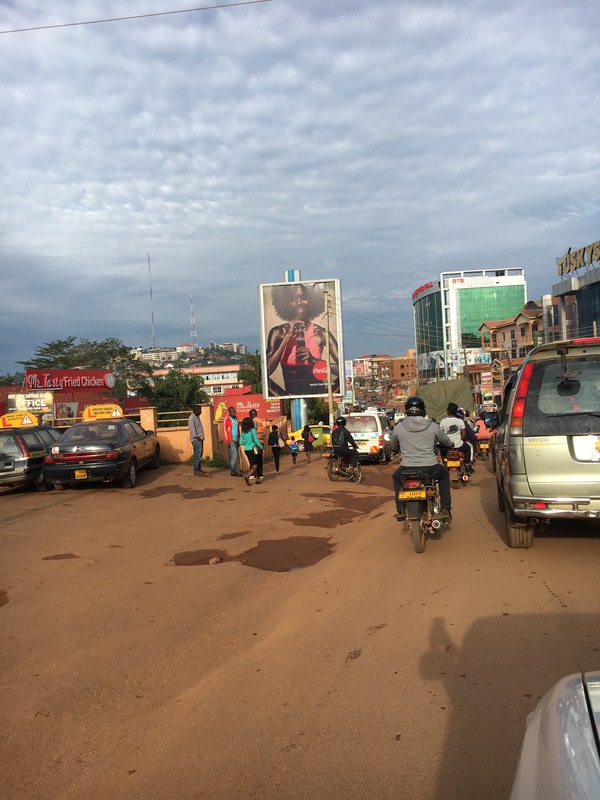 Below, I’ve listed a few of my favorite things about Kampala so far…some which I expected, and others which have taken me by surprise. Every day, I ride a boda boda to and from work. (Mom, please don’t freak out!) Rain or shine. It’s the best feeling to be weaving through traffic with the wind in my hair. Beats the NYC subway (for now at least!) Seeing as my office is off a dirt road (yes, it’s in Kampala city limits), it can get a little muddy. It’s like mud-riding. As my boss D put it, “You Americans play in mud for fun, but we don’t have a choice here.” Makes you think, right? I’ve also had some pretty interesting conversations with my boda drivers. A few people have recommended I get one driver and stick with him for the whole summer, but I’m just not ready for that level of commitment. Lol. Matoke is similar to mashed potatoes but made from a banana-like plant that grows on trees. It is one of the main food staples of Uganda! I love it…which is a good thing because it is served everyday for lunch in my office. Some other Ugandan foods I like? Posho (like mashed potatoes that taste like grits because it’s made out of corn meal), nakati (a bitter and salty dark green), and ground nut stew (literally mashed up nuts made into stew). Also, the garden behind our office has an avocado tree, so we get to eat fresh avocadoes every day for lunch! My office is pretty cool for the fact that we have 2 cooks on staff who prepare a home-cooked meal everyday for lunch, using fresh ingredients from the garden, and serve us at our desk! As much as I am loving Ugandan food everyday for lunch, I have a confession…we literally are served so much food, I cannot come close to finishing it everyday. I then get in trouble with D, the head of our legal department, who thinks I can do a better job of cleaning my plate! I guess she doesn’t realize if I did that, I would fall asleep at my desk from a food coma. All things considered, this is not a bad problem to have, and I am really enjoying the food! Speaking of food, my roommate and I ordered pizza my first night in town. Yes, you can order pizza in Uganda. It was delivered on the back of a boda boda…. Like any good New Yorker, I appreciate a good 24/7 neighborhood bodega. Imagine my surprise when I found one just around the corner from my house! It’s not open 24/7, but it’s open most nights until 11pm, and they sell potato chips, wine, and other important items. It kind of looks like a jail, and they hand you your items through the iron bars…you don’t even go inside. I love this place! My bed has a giant mosquito net, which i’ve never used! My favorite place at home! I will have a lot more to say about this as the summer goes on, but for now, I am working at a human rights organization here in Kampala focused on defending the freedom of expression, the free press, and journalists’ rights. I felt so welcomed by the team from day #1! Everyone in my office is a native Ugandan, except me of course haha. I am working with the legal department, which consists of D, K, and I. D is a mom of 4 with a law degree, and she is going back for a master’s degree this fall. I have mad respect for this lady! She is also hilarious, even when she is getting on to me for not finishing my food at lunch. My desk is next to hers, which is so nice because we have so much to talk about over the course of the day. K is another attorney on staff, and I got to go to court with him on Wednesday (more about this in a later post). K has been great at explaining the ropes to me, and I get to travel with him to northern Uganda next week for a trial! I is probably my best friend at work so far…he is exactly 2 weeks older than me and just finished his first year of law school, like me. He knows so much about American politics…more than a lot of Americans I know!! We’ve had some interesting discussions. The 4 of us in the Legal Department share an office with four cubicles, and the days go by so quickly as we have a lot of work to do and stories to share. One thing I’ve enjoyed in particularly is comparing cases from law school with the team. Uganda has a common law system based on British law, just like the USA, seeing as both countries are former colonies of Great Britain (geez England, you thought you owned everything there for a while!) As a result, Ugandan law schools study many of the same cases we study in US law school that date back…I was particularly amused to learn we both studied the Raffles case (yes, I was laughing about the Peerless with my Ugandan officemates today! Nerdiness knows no nationality!) I’ve also enjoyed discussing the similarities and differences in Ugandan and American civil procedure and the structure of the court systems with the team…literally the only time I’ve ever enjoyed talking about Civ Pro lol. The organization is much bigger than the legal department, and I’ve really enjoyed getting to know all of my many other colleagues who work on other aspects of human rights work. There is too much to share about the work I am doing and the things I am learning in this post, and I want to write about these things thoughtfully in a future post. Just know it’s really been a great experience so far! #nonewfriends? Nah…I’ve made so many great, new friends here in Kampala! It all starts with my roommate J from Canada…we both randomly found this apartment on our own, but it was like fate. J has been looking out for me since day 0. Before my arrival, she even stocked up on water and groceries for me, and let me in the apartment at 4:30am when I arrived! Right?! I am surprised too. I freaking love the wifi here…it’s actually better than what I have in NYC. I am using Vodaphone, and it’s been so great so far. I carry this little box with me everywhere I go, meaning I have wifi wherever I am. Considering I wasn’t sure if I’d have wifi at all (lol), this is fantastic! This little box goes with me wherever I go. One funny thing about Uganda is everyone goes by their last name first…so my vodaphone calls me “Smith”! It’s not nearly as hot here as I imagined it would be, and it even gets a little chilly at night. There’s also a nice rain about every other day. I can’t believe I am living on the Equator and the weather is so pleasant! This is just a preview of my first week in my new home! I know I will have so much more to share as the weeks pass…for now, Osiibye otya nno! (Good evening in Lugandan). Loving reading the perspectives you have on your time so far in Uganda. Welcome! Interesting to read about life in Uganda.